The 46.2 metre motor yacht Tutto Le Marrane has had a central agency change and is now listed for sale by Northrop & Johnson. Designed by Andrea Bacigalupo, she was built in GRP by Italian yard Arno to ABS class and delivered in 2011 as one of the yard’s fast Leopard models and has had only one owner since new. An interior by Cristiano Gatto accommodates 10 guests in five cabins consisting of a full beam master suite complete with hammam and spa, two full beam VIP suites and two doubles, all with entertainment centres, television screens and en suite bathroom facilities. 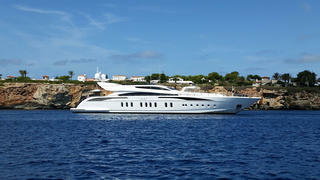 In addition, there are quarters for eight crew aboard this yacht for sale. A large saloon features comfortable furniture and can be transformed into a disco, boasting an entertainment centre including a 40 inch television screen while the media lounge offers a 52 inch television screen and a stereo surround sound system. Deck areas are extensive and include a large sun deck offering a full bar, sun loungers and an oversized Jacuzzi spa tub, ideal for al fresco relaxation and entertaining. Leopard yachts are famed for their turn of speed and Tutto Le Marrane certainly does not disappoint in this area. She is powered by twin 1,790kW MTU diesel engines and a central MTU booster of 3,440kW, all three coupled to KaMeWa waterjets. The resulting speed is impressive at 36 knots and she is fitted with Seakeeper gyroscopic zero speed stabilisers. Lying in Florida, Tutto Le Marrane is asking €12,900,000.